I probably don't need to tell you, my avid readers, that something pretty crazy spread across the Internet like wildfire back in April of this year. 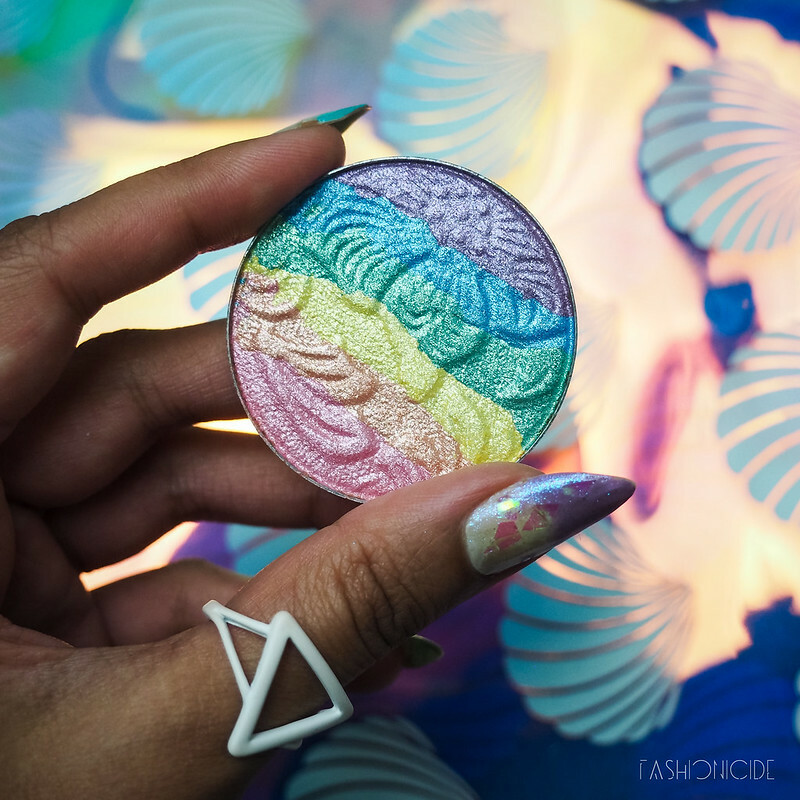 Yep, I'm talking Rainbow Highlighter. 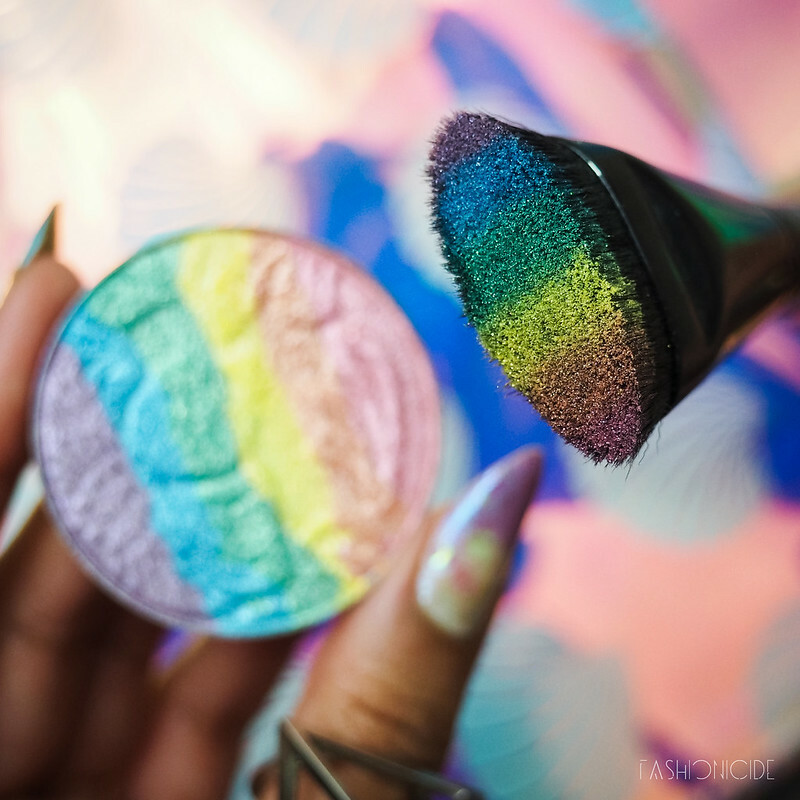 And more specifically, I'm talking Bitter Lace Beauty's Rainbow Highlighter - the original. I have to say, it looked pretty epic and certainly caught my attention. 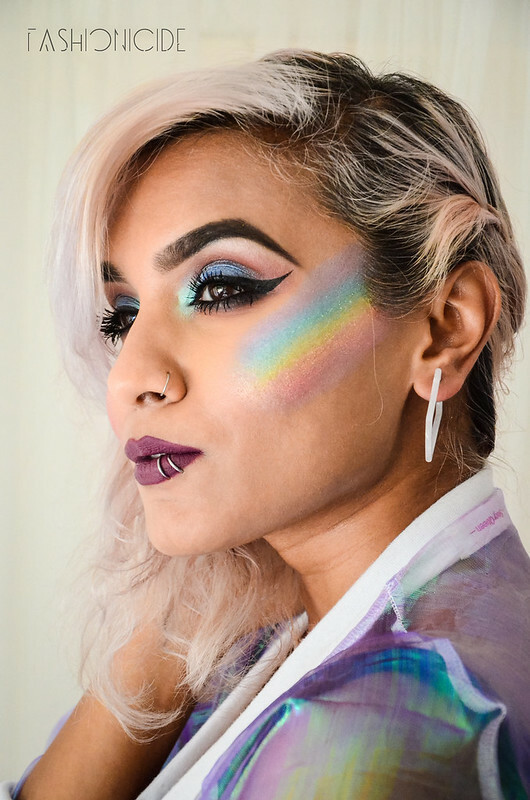 Unfortunately, I was still on a bit of a post-Japan downer, and managed to miss out on the first wave of hype, but when I did eventually get swept up by it, I wondered to myself what Rainbow Highlighter would look like on darker skin tones like my own. When the Huffington Post featured it on their website as part of a news article, that's when things started to go a bit crazy. So much so, the Bitter Lace Beauty Etsy store has now been ransacked. There's nothing left. And if you want their Prism (the rainbow) highlight, you're in for a 9 to 10 month wait. Oh, balls. But Depop came to my rescue, because let's be honest. I needed this. Or at least I thought it had came to my rescue. I purchased a Bitter Lace Beauty Prism Highlighter for £20, and it arrived just a few days later. Result. It looked the part: the packaging, the business cards and the highlight was embossed in the style of Bitter Lace Beauty. I took an excited pic, posted it to Instagram (obviously), and Bitter Lace Beauty themselves commented saying it was a fake. No indication as to what gave it away, it was just a fake and that was that. I can understand people taking their idea, but faking it? I don't get it. Anyway, I let it stew in makeup drawers for a couple of days. Deliberating in a The Clash-esque manner: Should I (let it) stay (in the drawer) or Should I go (for it). 'Cos if I let it stay there would trouble (20 quid wasted) but if I go for it there could be double (£20 wasted plus potentially ruined skin). We just never know what's in these products, but in the end I took the YOLO approach and went for it. At first I tried applying it with my Illamasqua Blush Up brush, swiping the brush back and forth across the powder until it was loaded with beautiful, beautiful colour. It felt like one of those cakes that are just too pretty to eat, and I half didn't want to ruin the beauty on my brush. But I summoned up the courage and swept it across my cheekbone and... Nothing. It was faint, real faint. 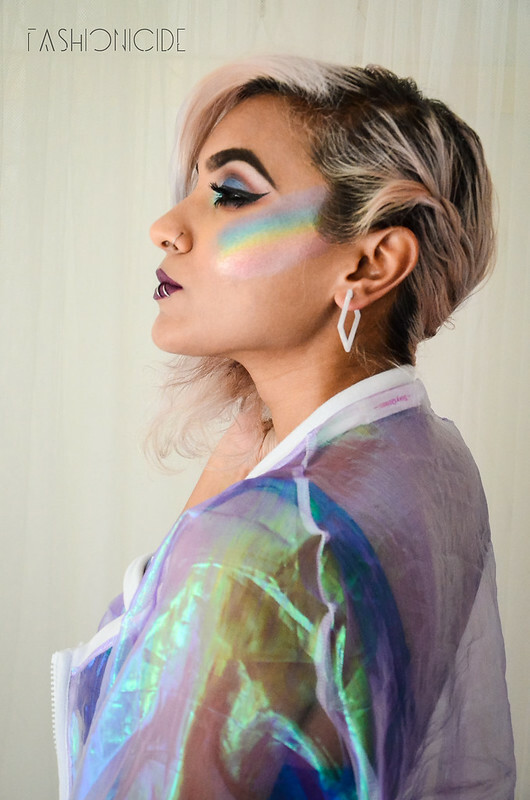 This wasn't Rainbow Highlight, this was the Outer Rainbow Highlight. You know, the one that is mostly invisible in the sky. Maybe that's the fakery of it coming through, but I gave it a try with my finger, and it worked like a charm. As you can see, it looks pretty incredible on the cheekbone, just as epic as I had hope that it would look. I'm glad that brands are starting to create more adventurous makeup, and that Indie brands are having a much bigger impact on the market. That's what I love about this. It's fun! Would I wear this one again? Probably not, I have no idea who made it, or what's in it, and I do value my skin too much to throw caution to the wind on this one. Will the trend still be around in the 9 or 10 months Bitter Lace Beauty are saying you'll have to wait for their Prism Highlight? 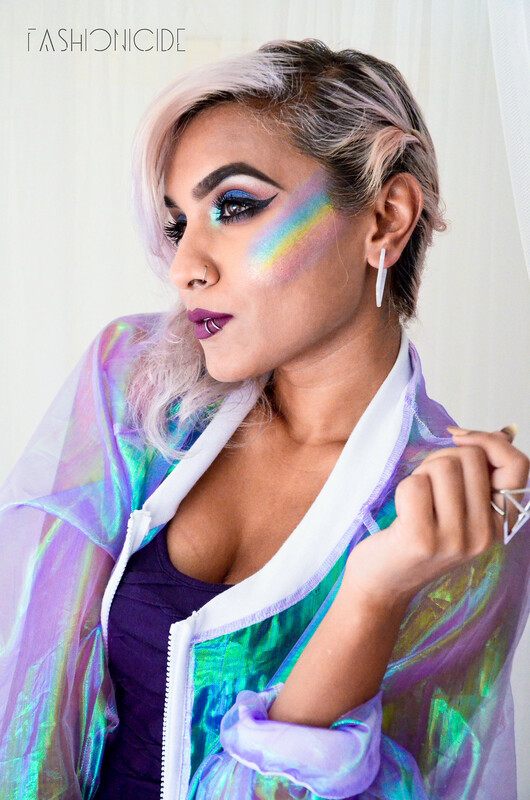 I don't know, but if you just can't wait that long, Phee's Makeup Shop offer their own alternative in the UK, as do Chaos Makeup in the USA - both look every bit as beautiful as Prism and will be well worth a try. I feel like I'm so out of the loop! I've never seen this highlighter before!! It's GORGEOUS!! Thanks for sharing. OMG How Gorgeous!!! I love your makeup and how you styled it with that gorgeous jacket! Killer post, love the pictures!